SoHo is a popular neighborhood for shopping in New York City. There is a wide range of shops in the area, appealing to shoppers with different styles, budgets, and sensibilities. In addition to many men's and women's clothing stores, there are also some great shops for foodies, souvenirs, and more. Most stores are open until about 10 a.m. - 8 p.m., except on Sundays when shops open around noon and close a bit earlier at 6 or 7 p.m.
SoHo has many popular chains (including Banana Republic, Madewell, J. Crew, Gap, etc. ), but our suggestions will focus on shops that are unique to SoHo. Prada: 575 Broadway, Even if you can't afford to buy anything at Prada, any shopping trip to the neighborhood should include a stop here, if only to see the unique architecture and design of the shop. Sur la Table: 75 Spring Street, Housewares aficionados be warned -- it's almost impossible to visit this store without finding something you "need" for your kitchen! They have great prices on Le Creuset and other high-end kitchen goods. Uniqlo: One of three NYC locations, Uniqlo offers inexpensive basics and a fun, funky vibe. Visitors are unlikely to find this Japan-based chain at home since. Nearest subways: B/D/F/M to Broadway/Lafayette; 6 to Bleecker St or Spring Street; N/R to Prince St.
Shopping path: Starting from Houston and Broadway, walk south along Broadway, shopping as you go. Take a right onto Broome Street, and then a right onto West Broadway, working your way north. 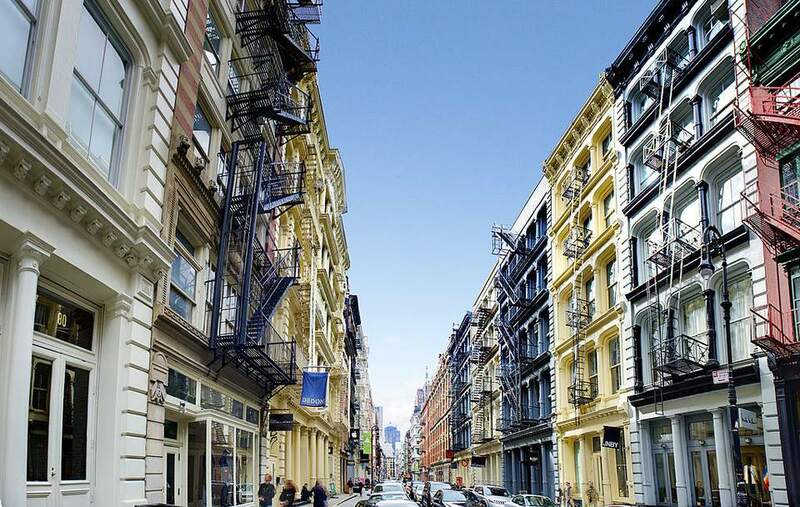 Spring Street and Prince Street are also home to many great stores, so you might choose to weave back and forth along Broome, Spring, and Prince between Broadway and West Broadway. Balthazar: 80 Spring Street, You can't go wrong with this classic SoHo eatery. They serve breakfast, lunch, and dinner and even have a great bakery where you can get a great coffee or pastry to fuel your shopping without taking up too much time. Make reservations if you want to have dinner (or even weekend lunch) because this is a popular choice. Insider tip: If you can't get a reservation, you can often pop in early to put your name on the wait list while you shop and explore. Boqueria: 171 Spring Street, This tapas spot serves lunch and dinner daily at its SoHo location, and brunch on the weekends. Dominique Ansel Bakery: 189 Spring Street, This bakery serves beautiful, refined pastries, but they also have sandwiches and both counter and table seating (as well as a year-round garden) if you're looking for a casual bite. They are also famous for inventing the Cronut and always have something special on offer. Spring Street Natural: 62 Spring Street, This restaurant is a great place to refuel with lots of salads (if you still need to try on clothes after you eat), as well as heavier fare and a full bar with great Bloody Marys. Ear Inn: 326 Spring Street, If you want a little bit of history with your drink, look no further than the Ear Inn, New York City's oldest working bar. Built in the late 18th century, the building has been designated a Landmark of the City of New York. Lucky Strike: 59 Grand Street, This casual bistro is the perfect place to grab a post-shopping drink or for your "I've had enough" shopping partner to take a break while you soldier on.